Throughout cultural history mental illness has been attributed to the influence of supernatural forces, the possession by evil spirits, demons or being a result of displeasing deities. Trephined skulls to release bad spirits are reported going back to the Neolithic Age (Porter, 2002, p. 10). Demonological thinking was prominent in early Chinese, Egyptian, Babylonian, Greek and Hebrew culture and culminated in the ‘Lunacy Trials’ of the Dark Ages, explaining mental illness by witchcraft, and the practice of exorcism (Kring, 2011, p. 9-10). The first physician who denied the influence of supernatural forces and suggested natural causes for ‘diseases of the brain’ was Hippocrates (Butcher, 2007, Kring, 2011). 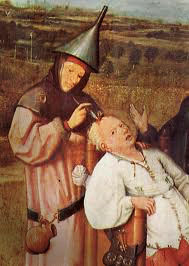 Upcoming asylums in the 15th century facilitated the life-long and inhumane institutionalization of mentally ill persons. Asylums were synonymous with cruel abuse serving public entertainment (Butcher, p. 37, Kring, p.11) until Philippe Pinel started reforming and humanizing asylums end of the 17th century (Kring, p.12). Scientific understanding of mental illness started late with discoveries of Louis Pasteur and Francis Galton, but still lacked ethics and human understanding as the infamous eugenics movement at the beginning of the 19th century demonstrated (Black, 2005). It wasn’t until the work of Sigmund Freud that mental illness was formulated conceptually in psychoanalytic theory and in its trail, based on experimental-rational observation, via behaviorism (Kring, p. 17-22). The focus on human needs and development was the work of pioneers such as Adler, Jung, Erikson, Fromm, Maslow, Rogers, Horney and Klein. We can conclude that the paradigm shift from irrational to rational beliefs about mental health is not attributable to science alone, but the combination of science with humanistic philosophy that recognizes patients as subjects, not objects of assessment and treatment. As a result we see patients today as individuals whose personal development as well as social- and occupational functioning should be supported. This perspective is enhanced by the current global transformations of social life-worlds reinstating questions of the good life (Robbins, 2008). Modern clinical appraisal entails the use of idiographic (individual) and nomothetic (shared across individuals) tools to assure internal consistency, inter-rater reliability, content- and construct validity, allow for generalization and sensitivity to treatment change. Besides, psychometric instruments also have to prove clinical utility (Hunsley et al, 2008, p.7). Evidence-based practice (EBP) should include best available research to serve patients, clinical expertise promoting positive therapeutic outcomes and should collaboratively respect a patient’s context, including culture, individual personality, strength’s and preferences since positive mental health outcomes depend on a patient’s active involvement (Norcross et al., 2008, p.5-6). In individual case-formulation treatment response informs and revises diagnosis to optimize treatment outcomes and it avoids the labeling of clients.Case formulation in psychology should not be confused with clinical diagnosis in psychiatry. Biological Factor: in the case of correctly diagnosed Bipolar Disorder a pharmacological approach would be adequate considering the administration of newer generation SSRI’s or SNRI’s (Seligman et al., 2007, p.45). Psychological Factor: In the case of low Self-Esteem and depression evoked by nurturing self-defeating beliefs, Rational Emotive Behavior Therapy (Ellis & MacLaren, 2004, p.26) would a valid choice or, if the patient’s problem involves more explicit behavioral components, Cognitive Behavioral Therapy/ CBT (Anderson et al., 2009, p.8). Social Factor: Dealing with anxieties and depression created by announced layoffs at one’s company could be addressed with problem-solving therapy addressing maladaptive coping and improving a patient’s ability to pragmatically manage stressful life-events (Eskin, 2013). I understand mental illness from both a humanist and pragmatic, problem-solving perspective which entails positively empowering a patient’s Self as well as his or her social- and occupational functioning. Appraisal requires to be conducted by proven and reliable multi-item tools that demonstrate content and context-validity to allow for an in-depth clinical understanding. Besides, psychometric instruments have to prove clinical utility and efficacy. Treatment planning needs to include a review of state-of-the art research, standardized diagnosis, assessment of epidemiology, primary and secondary symptoms, properties of a disorder (onset, course and duration) and etiological identification of underlying biopsychosocial factors (Seligman et al., 2007). Treatment logically addresses diagnosed properties. Andersson, G., & Cuijpers, P. (2009). ‘Psychological treatment’ as an umbrella term for evidence-based psychotherapies? Nordic Psychology, 61(2), 4-15. Black, E. (2005). War against the weak: Eugenics and america’s campaign to create a master race. New York City: Dialog Press. Butcher, J. N., Mineka S., Hooley, J.M. (2007). Abnormal Psychology. Ed. Susan Hartman. 13th ed. Boston: Pearson Education, Inc.
Ellis, A., & MacLaren, C. (2004). Rational emotive behavior therapy, a therapist\’s guide. (2 ed.). Atascadero, CA: Impact Pub. Eskin, M. (2013). Problem solving therapy in the clinical practice [electronic book] / Mehmet Eskin. London ; Elsevier, 2013. Hunsley, J., & Mash, E. J. (Eds.). (2008). A guide to assessments that work. New York, NY: Oxford University Press. Kring, A. M., Johnson, S. L., Davison, G. C., & Neale, J. M. (2010). Abnormal psychology (11th ed.). Hoboken, NJ: John Wiley & Sons. Norcross, J. C., Hogan, T. P., & Koocher, G. P. (2008). Clinician’s guide to evidence-based practices: Mental health and the addictions. Oxford, England: Oxford University Press. Seligman, L., & Reichenberg, L. W. (2007). Selecting effective treatments: A comprehensive, systematic guide to treating mental disorders (3rd ed.). San Francisco, CA: John Wiley & Sons.